The Longhorn Steakhouse menu is ever changing and they are always coming up with amazing recipes. In their fall menu they are serving up some creamy Longhorn Steakhouse Mushroom Truffle Bisque, and this is one soup you don’t want to miss. 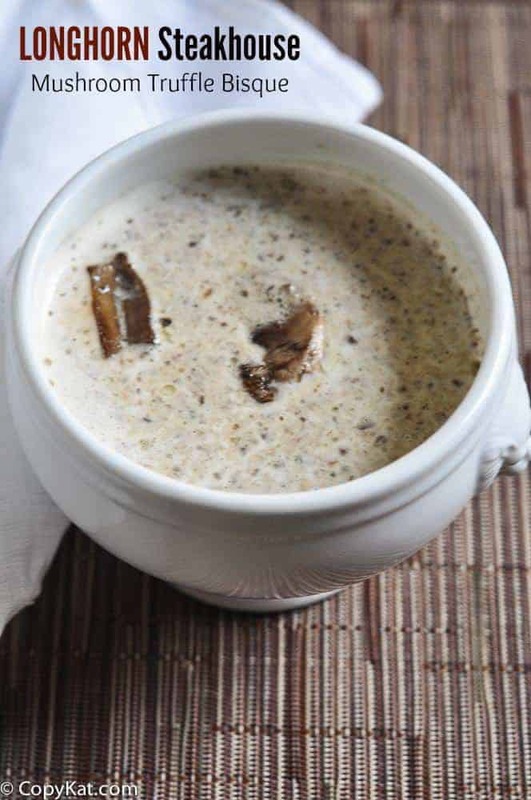 Mushroom bisque is a wonderful creamy soup that is perfect for fall. The Longhorn Steakhouse Mushroom Truffle Bisque copycat recipe is made with two different types of mushrooms, and a touch of truffle oil. Truffle oil is a wonderful addition to so many mushroom dishes. This soup can easily put together in very little time, but it tastes like you slaved for hours in the kitchen. The layers of mushrooms in this soup is sublime. We are using three different mushroom flavors to make a robust mushroom flavor. I find that when you layer any type of mushroom soup with multiple types of mushrooms you get a full flavor that brings out the best in possible flavor. We are using baby portobello mushrooms and white button mushrooms for the base of the soup. We are using a touch of truffle oil to help boost the flavor. Truffle oil is an ingredient that is a splurge. While it is a splurge you don’t need to use very much of it to notice it in a recipe. There are a lot of false truffle oils out there that have been flavored with a synthetic compound which is most often thioether (2,4-dithiapentane). I personally like to by my truffle oil from a reputable retailer such as Costco, or the SpiceHouse, because I feel like they are more reputable and they strive to use real truffle oil. I find this soup goes well with some hot rolls. I really like the Texas Roadhouse Rolls makes a great choice. These sweet rolls compliment this soup very well. This soup is so rich and flavorful. Perfect for those who love mushrooms. Melt 2 tablespoons butter in a medium sized skillet over medium heat. Add sliced mushrooms and chopped onion. Sprinkle mushrooms and onions with salt. Cook until the onions have become transparent and the mushrooms have released their water. Add chopped garlic, and saute for 1 to 2 minutes.In a medium sized saucepan add chicken broth, and the mushroom mixture. Heat through. Use either a stick blender, or a food processor to process soup. Process soup until the mushrooms are chopped very fine. Add heavy cream to the soup, and heat until the soup is warm. Add truffle oil just before serving. You may want to drizzle a bit of sour cream if desired on the soup just before serving. Using the 2.4 ingredient does what to the taste of the soup? I’ve never uses truffle oil so I don’t know good from bad. I am sorry I don’t quite understand the question. Think I will answer your open ended question about favorite bisque. Mine is Squash Bisque. If you have a CopyKat for this I would love to give it a try. It is about that time of year! I hate to say this, but I often have bought squash in a can, and added some chicken stock, added some seasonings, like perhaps some salt, then curry, then I would let that reduce, then finish with a bit of heavy cream. I should try this some fresh vegetables. Thanks Steph, going out and get a Butternut Squash this morning. The curry spice is what I needed to be reminded of. Forgot that is the key ingredient. Maybe even a dash of nutmeg too. Grilled chicken, Bisque and a day of college football. God is Good!! This soup was fantastic! Next time, I’m going to use shallots instead of onions. So easy and just delicious. Thanks for sharing! Oh, I bet that would be fantastic. That is a great suggestion! Bad News. Costco now sells ‘truffle’ oil half the price of the old one, because there is no longer truffle in the bottle. It has been replaced by 2,4 dithiapentane. Suggest consumers always check the ingredients. ‘Truffle flavor’ means chemical flavor. Nice recipe, by the way. I just made this. Amazing. I used truffle oil instead of butter to saute the mushrooms and onions. I also made a roux by adding a litter flour to the saute. I did not use a stick blender or any other blender to chop the mushrooms up. I personally love mushrooms. I say this is very much like what I had at Long Horn and I got a bowl to go I loved it so much. Thank you for sharing. This is added to my recipes now. Awesome! Thank you for the inclusion! This bisque looks fabulous! Love it! Thank you! What’s your favorite type of bisque? I used black truffle oil. Great tip. I will give it a try. I am happy to hear you enjoy the recipes.